The Earth's crust is broken up into around seventeen major pieces that we call tectonic plates. These plates form a jigsaw pattern around the planet with their edges interacting to cause earthquakes, volcanoes, mountain ranges and deep ocean trenches. But what makes up these jigsaw pieces? The crustal plates are made up of the two types of crust - continental crust and oceanic crust. We classify plates into three groups depending on their size - Major, Minor, and Micro plates. These are plates that are greater than 20 million square kilometers. By the way, lots of maps divide the Indo-Australian plate into two separate plates...but I have not seen any evidence that they are separate. One day we will have evidence for one way or the other...but for now, the evidence does not show them being two plates. These are plates that are less than20 million square kilometers but greater than one million square kilometers. These are plates that are less than one million square kilometer in size. Currently, around 56 have been identified, but this changes as new information is discussed by scientists studying the Earth's plates. Imagine a hard boiled egg with the shell cracked before you peel it. You will find large pieces, smaller pieces and in some places lots of tiny pieces. That is what the Earth's crustal plates are like. One major misconception is that a plate can only be ONE type of crust. For example, a plate made up of just continental crust. But this is not the case. Most plates are made up of a combination of crustal types with oceanic crust welded onto continental crust. So the boundaries between the types of crust are NOT necessarily the boundaries between plates. Also, you have to remember that sea level does not govern where continental crust ends. 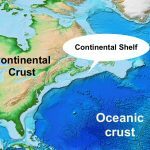 Continental crust can extend way out under the ocean. One important difference between these two types of crust is their "buoyancy" dues to the density of the rocks. Because continental crust is made up of rocks of all types, including those rich in quartz, they are relatively less dense than the oceanic crust which is made up of silica-poor (ie no free quartz) basalt. Becuase of the 'buoyancy of continental crust, it has a survived many of the changes on the surface of our planet, and so here you find the very oldest rocks of the crust. ← The Earth’s Crust – a simple way to view it.